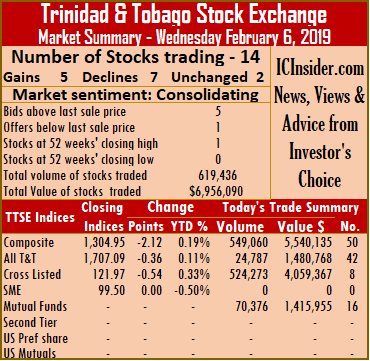 Market activity on the Trinidad & Tobago Stock Exchange ended on Wednesday with 14 securities trading against 12 on Tuesday, with 5 advancing, 7 declining and 2 remaining unchanged. At close of the market, the Composite Index declined by 2.12 points to close at 1,304.95. The All T&T Index lost 0.36 points to 1,707.09, while the Cross Listed Index fell 0.54 points to close at 121.97. Trading ended with 619,436 shares at a value of $6,956,090, compared to 138,119 shares on Tuesday valued at $2,094,012. IC bid-offer Indicator| The Investor’s Choice bid-offer ended at 5 stocks with bids higher than their last selling prices and 1 with a lower offer. Stocks closing with gains| Clico Investments added 2 cents and ended at $20.18, with 70,376 stock units changing hands, First Citizens increased 10 cents to settle at $34, after exchanging 3,105 shares, Massy Holdings rose 25 cents to close at a 52 weeks’ high of $47.75, after exchanging 1,112 shares. Prestige Holdings closed with a gain of 5 cents in trading of 2,730 units at $7.40 and West Indian Tobacco gained 2 cents and ended at $95.42, with 6 stock units changing hands. Stocks closing with losses| Agostini’s fell 5 cents to $23.15, after exchanging 1,732 shares, Angostura Holdings fell 1 cent and ended at $16.04, with 200 stock units changing hands, Ansa Mcal shed 20 cents and completed trading of 2,027 units at $55. JMMB Group lost 4 cents and ended at $1.75, after exchanging 51,813 shares, National Flour fell by 1 cent and completed trading of 642 units at $1.64, NCB Financial Group lost 5 cents and settled at $8.40, after exchanging 472,460 shares and Republic Financial Holdings concluded trading with a loss of 3 cents at $107.52, after exchanging 9,725 shares. Stocks closing firm| Guardian Holdings completed trading of 230 units at $18 and Trinidad & Tobago NGL completed trading with 3,278 units at $29.20.